Today, I have an important announcement to make. I’m thrilled to share with all of you that on the 25th of November 2014, my nephew was born. This post was actually slated to be made on the last week of November but the welcome intrusion into our family and the duties it brought forth ensured that this had to be postponed. Needless to say, I was over the moon as I lay my eyes upon him and took care of him for the first week of his life. My prior experience with my little fellow ensured that I took to tending to a new born like a fish takes to water. It was not easy to leave my precious nephew on the day of my departure back to Mumbai, but since other duties beckoned, I had to make the slated move. My chocolate chip cookies have been a huge hit with my friends and family and at my son’s birthday parties. These have a gorgeous cookie texture and the intermittently spaced chocolate chips give the palate the necessary chocolate delight. 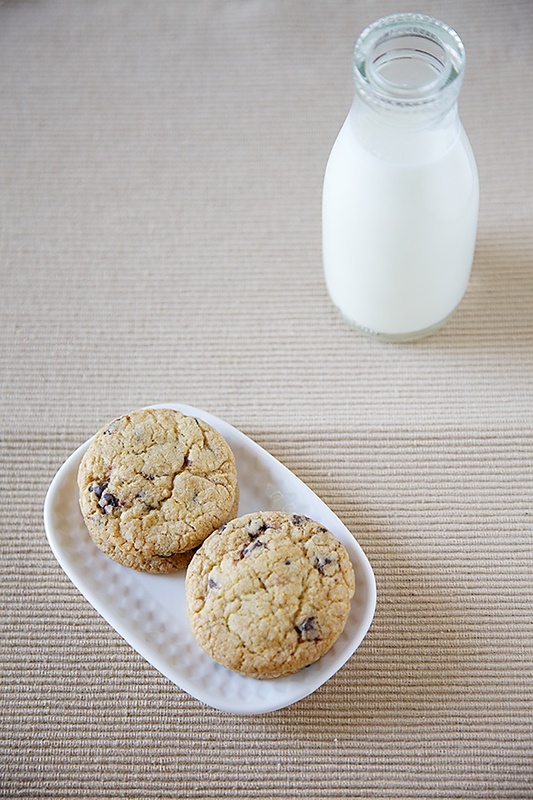 You could make these crisp by baking your cookies for a few extra minutes or you could make them soft by baking them for a few minutes less depending on how you like your cookies. My family prefers crispy cookies so I tend to bake them until crisp. If the texture of the cookies is very important to you then make sure you get your oven timing right and trust me it is not as difficult as it sounds. It involves just a little bit of trial and error and you would have arrived! Before our little munchkin arrived on the scene, I hardly baked cookies as both Ro and me would rather prefer cake to cookies. I took to baking cookies in a big way only because of our son and his friends. 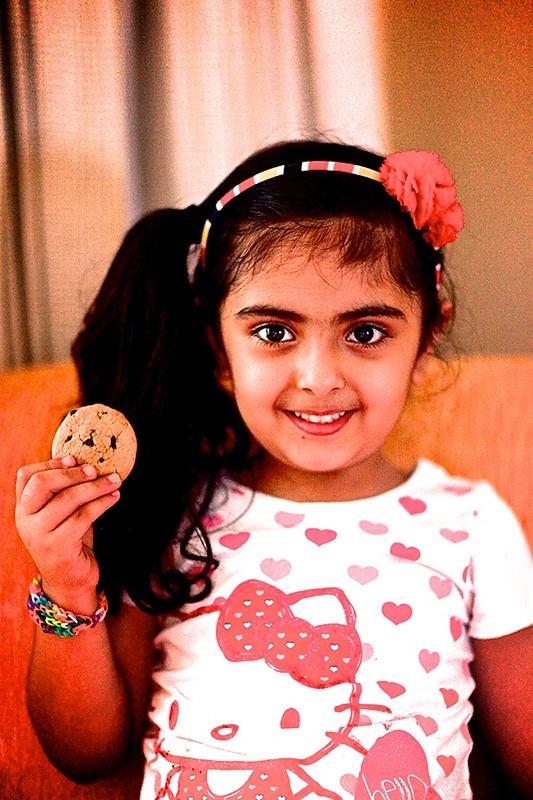 These cookies have been taste tested and approved by Hari’s friends but the biggest fan of these cookies has to be his friend Dhwanie, one of the sweetest little girls I have known. 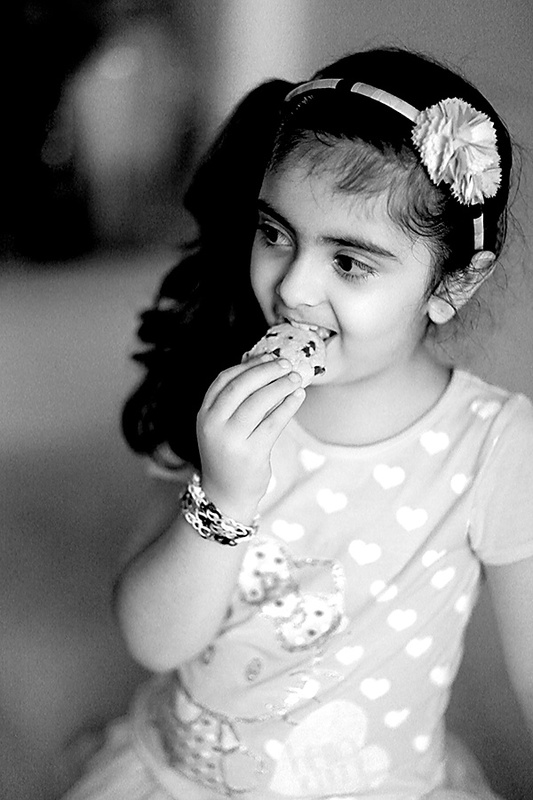 She loves these cookies a lot and is quite vocal and uninhibited in expressing the same! And she happily posed for me when I offered her favourite cookie. Seeing these children relish the cookies made by me gives me a deep sense of satisfaction and make my efforts seem worthwhile. And I look forward to feeding my little nephew his first cookie and many cookies thereafter! These cookies will make great home made and personalized gifts for the holiday season. I do hope you and yours enjoy these cookies as much as my family and friends do. You can halve the recipe if you want to make a smaller batch. I always tend to make a large batch of these cookies as there are always people to share these with. In a large bowl, using a stand mixer or a beater cream the butter, sugar and vanilla extract until soft and creamy. Mix in the baking soda into the plain flour and stir well. You could also sieve the mixture once to make it uniform. Next, put in half the flour and half the milk and mix well. And then put in the remaining flour and milk and mix well until the cookie dough is smooth, about 3 to 4 minutes. 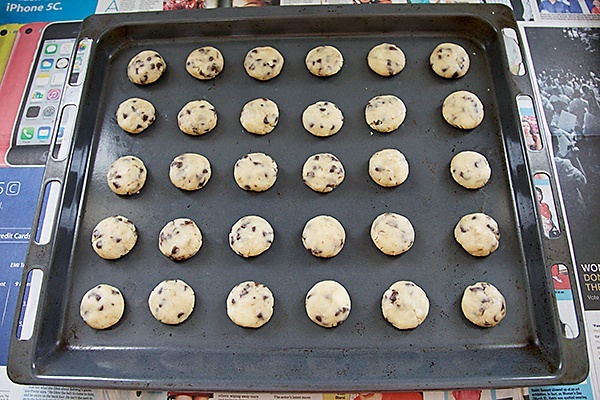 Finally, fold in the chocolate chips into the cookie dough so that they are evenly distributed in the cookie dough. Divide the dough into round balls, depending on the shape you desire and then press them slightly like how you would press patties. 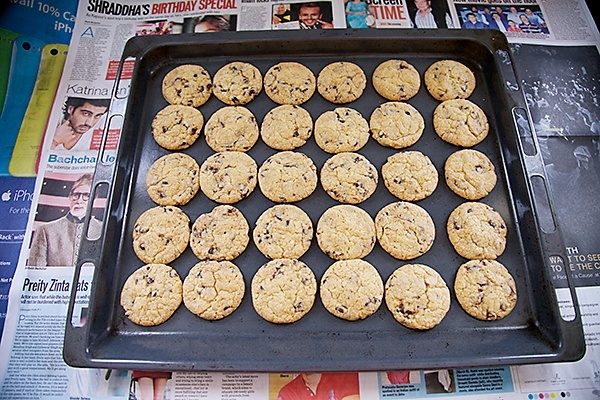 Now place them on a baking tray lined with greaseproof paper or on a tray with a non stick surface. Bake for 15 to 20 minutes, until the edges are golden brown . Cool completely, remove from the tray and store in air tight containers. In subsequent recipe testing, I have figured that 1 tsp of baking soda is enough for this recipe. Radhika- Thank you so much! Will surely keep your request in mind. Happy cookie baking! Anushruti I made these cookies today and they are totally yum. I altered the recp with 50-50 icing sugar with castor sugar. result was perfect with crusty top and tender center. someday am gonna try these with cranberries. I altered the recp with 50-50 icing sugar with castor sugar. result was perfect with crusty top and tender center. someday am gonna try making these with cranberries. 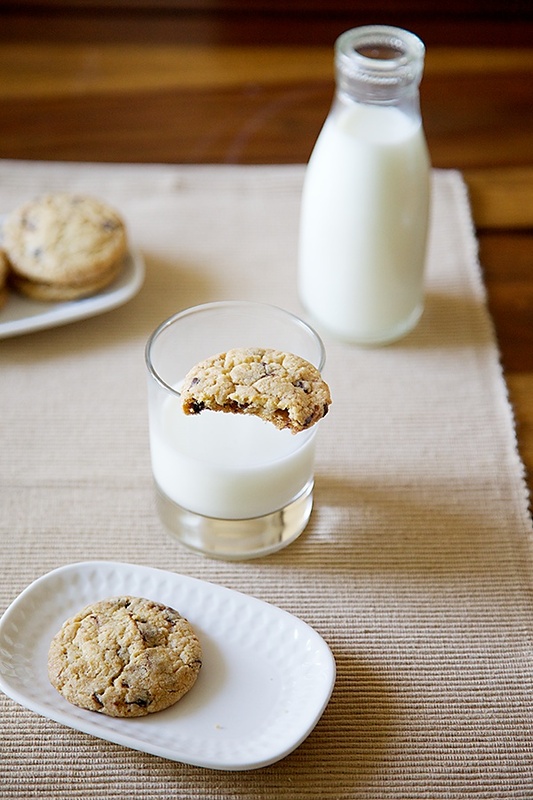 We like our cookies extra crisp too. 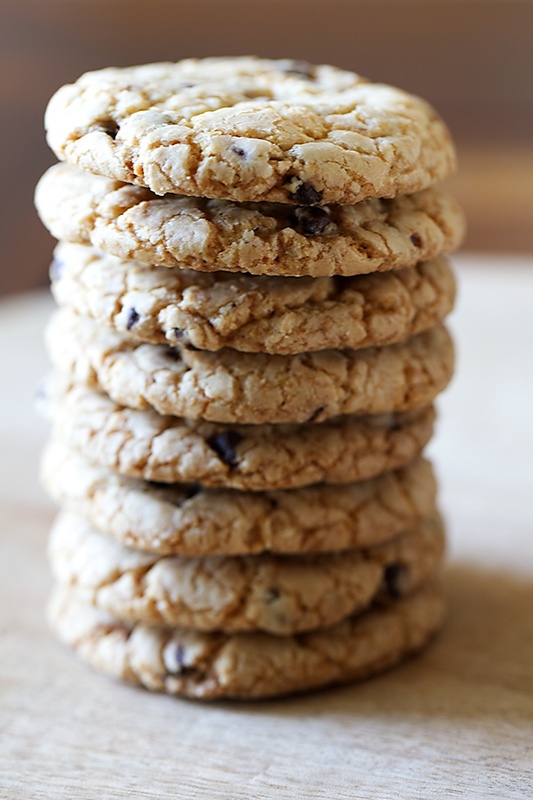 I have to confess I am not used to chocolate chip cookies, I grew up with european cookies, but my husband loves them! He won't mind anew recipe too without eggs, thank you for sharing! I have everything at home but not any oven to bake these cookies. I think I must but it now. Hi Anu,Can I use regular cane sugar instead of icing sugar. Do these cookies come out as soft or crunchy? How about using Flax seed powder +3 tbsp water as egg replacer? Bhakti: Good to hear that! Helene- Thank you so much! Hope your husband likes these cookies if you happen to bake them. varsha- This is recipe is great and I wouldnt want to change a thing about it and they definitely didnt look like they needed flax. They can be soft if baked for 10 to 12 minutes or crunchy if baked for 15 to 18 minutes. I baked these cookies for christmas and they were an absolute hit! My dad usually stays away from anything sweet and yet these managed to lure him to the kitchen and eat 3 in a go! I had one question, after they cooled, some of my cookies have become quite hard, its tough to break them in two. I had replaced chocochips with a bar of dairy milk broken down as i like my cookies to have chunky bits and baked them for 15-18 mins. They still taste perfect, but were they perhaps overdone? or is there another reason they became hard on cooling? 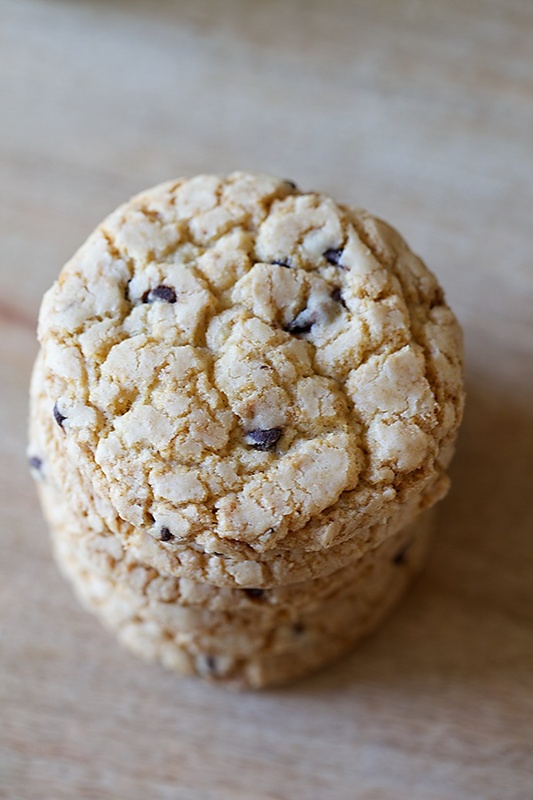 Yashi- Happy to hear that these cookies were a hit! Try baking for 12 to 15 minutes if you want soft cookies. I am glad to find a sattvik site finally after so long. Tried your red velvet and it turned out amazinggggg. You definitely have the most safe fail recipes. But this time I tried these cookies. They got burnt from the bottom only after 10 minutes of baking. Where do u think I went wrong ? Priyal- you need to put the cookies in the centre of the oven where they will get heat from all sidesof the oven. Also check the oven temperature. Nice to know that your cakes turned out well. Mamatha: You are welcome! I'm so happy you appreciate my recipes. I was wondering if instead of the butter I can use canola oil? I love your recipes especially since I love baking and I'm always hunting for eggless recipes! The chocolate chip cookies were flawless :-)Thanks! hie. Drool worthy pics and a great recipe as ever. one question- Can I use broken chocolate chunks instead of chips as I cant seem to get them around here? Hi,the pics. look v. inviting. Just wanted to make sure the brand of butter u hv used. Also is it ok to use half cookie margarine & half amul butter. Also if I replace the icing sugar with brown sugar & granulated sugar, will it alter d outcome? Thanks in advance. Thank you for posting this drool worthy recipe. As my oven is small, Is it ok to leave the remaining dough in room temperature. Hi, one more query. As per your conversion page, 1 cup(250ml) icing sugar equals 125gms. The receipe here mentions 2cups=440gm. How much sugar is to be used? Padma: I havent tried making these cookies with oil, it might work but the cookies will be dense. Harshi: Butter gives a good flavour to these cookies. 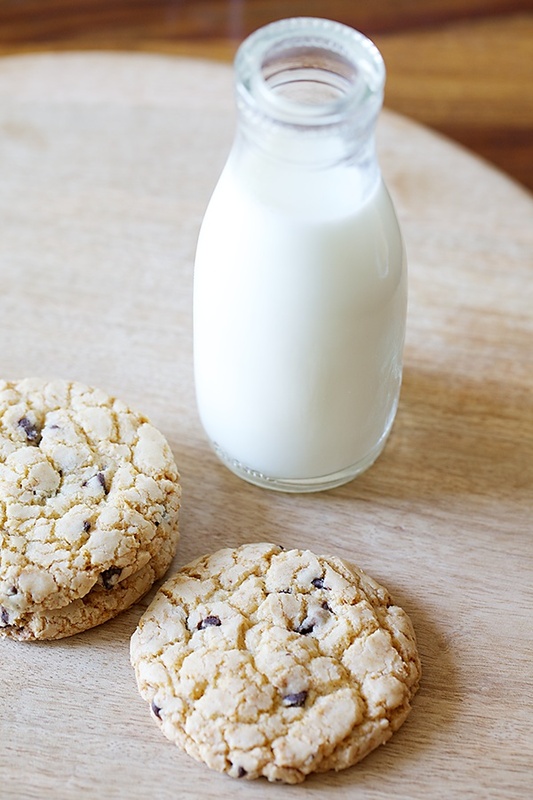 Changing the sugar will alter the texture of cookies. Granulated sugar will give grainier cookies. Bhawna: Yes you can leave the cookie dough in room temperature, until you finish baking the entire lot. Harshi: 3 1/2 cups = 440 gm icing sugar. The error has been rectified. Thanks. Thank you Anushruti for your recipes. These chocolate chip cookies and the eggless blueberry muffins are firm family favourites. Absolutely delicious! Guests often are amazed to learn that ours is an egg free home. Kap: Awesome! How nice to hear that! I tried them and they were the most perfect cookies I ever made! Instead of adding choco chips, I pressed M&Ms in top of them and they looked cute. Tried your whole wheat and oats cookies too and they turned out excellent. Love your blog – your recipes, your philosophy of cooking with Ayurvedic principles, simplicity & finesse of your recipes, and your writing. Best wishes for your continued success with the blog and shows. Mina: Thanks so much for your kind words. Made my day! Hope to hear more from you. do your children have the same diet as you? Lactovegan with no onion and garlic? do they get all the nutritients? emma- Thanks for your question. We had the same diet too, when we were kids and yes my son follows the same diet too. Infact, this diet can be traced to thousands of years in history and was followed in the vedic era as well. Can I substitute part of the APF with WWF? If any inputs' regarding the same, Please, let me know. Love ur all baking recipes ! Simple fab I am in awe of them thank u so much..
Preeti- Thank you! Yes you can replace the maida with atta. Hi Anushruti, I made these cookies yesterday and they had a fab taste.Looked gorgeous.Although I didn't overbake them , they still were hard. It was hard to break them. What could be done to avoid that? 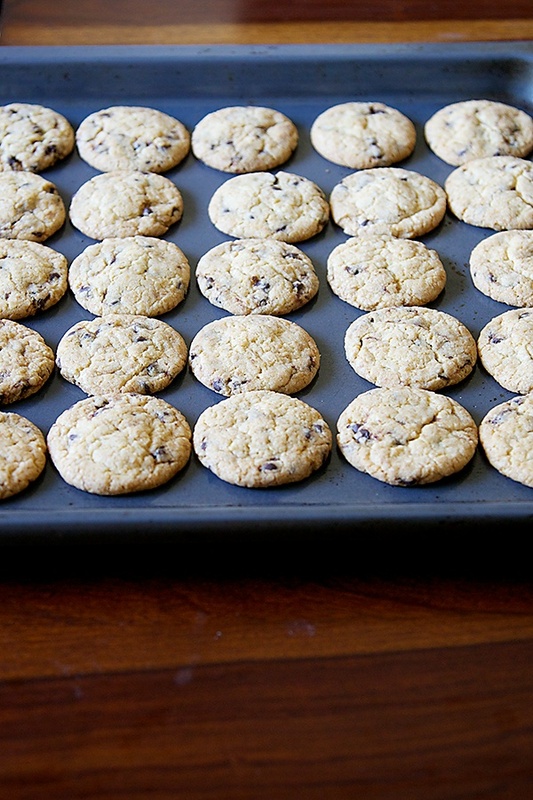 Bake them for a much lesser time than you did the last time for softer cookies. Maybe 12 minutes? First of I I'd like to congratulate you as you are doing a wonderful job….beautifully. I'd love to try your recipes for sure. But I need to mention that I simply love watching them. Each and everything around you is so beautiful, meticulous and wonderful. Obviously including you :). Looking forward to more and more recipes here. Thanks for recipe it turned out to be perfect. I substituted maids with plain flour and half demmera sugar. they have turned out heavenly. Also made exact 24 cookies, showing that numbers in recipe deliver exact result. Hi can we use condensed milk to make cookies? Himangi- Thanks for the feedback. Maida is nothing but plain flour. Happy baking! Vishaka- Yes you can! But I will need to post a separate recipe for that. Hi Anu these cookies look tempting. 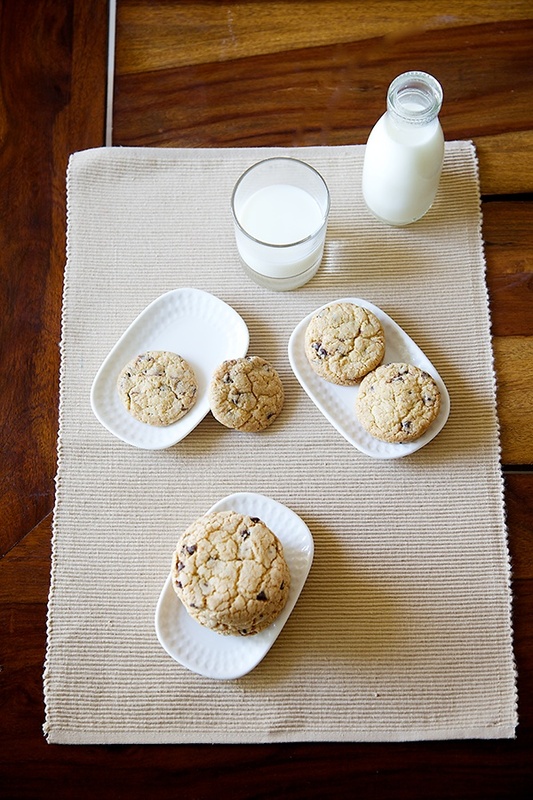 With the holiday season looming ahead have been looking out for some cookie recipes for my son – these look perfect! Wanted to check with you if we can freeze half the batch in case i am not able to bake all at one go? Hi Manju…yes, you can freeze the dough!